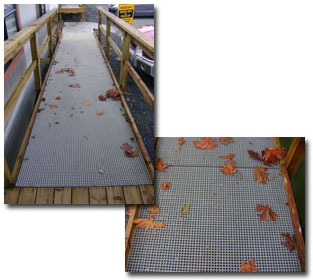 We recently sold 5 sheets of Prismagrate FRP Grating Mini-Mesh to a local contractor for a wheel chair ramp. The contractor liked the material so much because of the ease of use, slip resistance, non-rotting attributes and aesthetic appearance, that he bought another 8 sheets for other areas on the same job. Ramps can be found at schools, marinas, recreation centres, churches, walkways, libraries – nearly any public area and Prismagrate FRP Mini-Mesh is a cost effective, non-slip, low maintenance alternative to wood ramps. Prismagrate FRP Grating Mini-Mesh flooring system is easy to install, has high load capacity and is extremely long lasting making it ideal for a variety of outdoor applications with high aesthetic demands.